This article is about the Shrapnel artillery shell. For fragmentation of artillery shells in general, see Fragmentation (weaponry). Setting a time fuse (left) and loading a shell into a gun. Shrapnel shells were anti-personnel artillery munitions which carried a large number of individual bullets close to the target and then ejected them to allow them to continue along the shell's trajectory and strike the target individually. They relied almost entirely on the shell's velocity for their lethality. The munition has been obsolete since the end of World War I for anti-personnel use, when it was superseded by high-explosive shells for that role. The functioning and principles behind Shrapnel shells are fundamentally different from high-explosive shell fragmentation. Shrapnel is named after Major-General Henry Shrapnel (1761–1842), a British artillery officer, whose experiments, initially conducted on his own time and at his own expense, culminated in the design and development of a new type of artillery shell. This engraving shows a 12-pounder U.S. shrapnel shell c. 1865. It is fitted with a Borman fuze. In the cutaway view, the dark grey is the wall of the shell, the medium grey is sulphur resin, the light grey are the musket balls, and the black is the bursting charge. In 1784, Lieutenant Shrapnel of the Royal Artillery began developing an anti-personnel weapon. At the time artillery could use " canister shot" to defend themselves from infantry or cavalry attack, which involved loading a tin or canvas container filled with small iron or lead balls instead of the usual cannonball. When fired, the container burst open during passage through the bore or at the muzzle, giving the effect of an oversized shotgun shell. At ranges of up to 300 m canister shot was still highly lethal, though at this range the shots’ density was much lower, making a hit on a human body less likely. At longer ranges, solid shot or the common shell — a hollow cast-iron sphere filled with black powder — was used, although with more of a concussive than a fragmentation effect, as the pieces of the shell were very large and sparse in number. 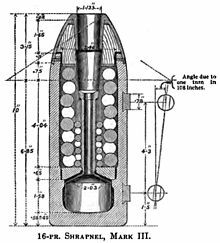 Shrapnel's innovation was to combine the multi-projectile shotgun effect of canister shot, with a time fuze to open the canister and disperse the bullets it contained at some distance along the canister's trajectory from the gun. His shell was a hollow cast-iron sphere filled with a mixture of balls and powder, with a crude time fuze. If the fuze was set correctly then the shell would break open, either in front or above the intended human objective, releasing its contents (of musket balls). The shrapnel balls would carry on with the "remaining velocity" of the shell. In addition to a denser pattern of musket balls, the retained velocity could be higher as well, since the shrapnel shell as a whole would likely have a higher ballistic coefficient than the individual musket balls (see external ballistics). The explosive charge in the shell was to be just enough to break the casing rather than scatter the shot in all directions. As such his invention increased the effective range of canister shot from 300 metres (980 ft) to about 1,100 metres (3,600 ft). He called his device 'spherical case shot', but in time it came to be called after him; a nomenclature formalised in 1852 by the British Government. Initial designs suffered from the potentially catastrophic problem that friction between the shot and black powder during the high acceleration down the gun bore could sometimes cause premature ignition of the powder. Various solutions were tried, with limited if any success. However, in 1852 Colonel Boxer proposed using a diaphragm to separate the bullets from the bursting charge; this proved successful and was adopted the following year. As a buffer to prevent lead shot deforming, a resin was used as a packing material between the shot. A useful side effect of using the resin was that the combustion also gave a visual reference upon the shell bursting, as the resin shattered into a cloud of dust. It took until 1803 for the British artillery to adopt (albeit with great enthusiasm) the shrapnel shell (as "spherical case"). Henry Shrapnel was promoted to major in the same year. The first recorded use of shrapnel by the British was in 1804 against the Dutch at Fort Nieuw-Amsterdam in Suriname. The Duke of Wellington's armies used it from 1808 in the Peninsular War and at the Battle of Waterloo, and he wrote admiringly of its effectiveness. In the 1870s William Armstrong provided a design with the bursting charge in the head and the shell wall made of steel and hence much thinner than previous cast-iron shrapnel shell walls. While the thinner shell wall and absence of a central tube allowed the shell to carry far more bullets, it had the disadvantage that the bursting charge separated the bullets from the shell casing by firing the case forward and at the same time slowing the bullets down as they were ejected through the base of the shell casing, rather than increasing their velocity. Britain adopted this solution for several smaller calibres (below 6-inch)  but by World War I few if any such shells remained. The size of shrapnel balls in World War I was based on two considerations. One was the premise that a projectile energy of about 60 foot-pounds force (81 J) was required to disable an enemy soldier. A typical World War I 3-inch (76 mm) field gun shell at its maximum possible range traveling at a velocity of 250 feet/second, plus the additional velocity from the shrapnel bursting charge (about 150 feet per second), would give individual shrapnel bullets a velocity of 400 feet per second and an energy of 60 foot-pounds (81 joules): this was the minimum energy of a single half-inch lead- antimony ball of approximately 170 grains (11 g), or 41-42 balls = 1 pound. [note 1] Hence this was a typical field gun shrapnel bullet size. The maximum possible range, typically beyond 7,000 yards (6,400 m), was beyond useful shrapnel combat ranges for normal field guns due to loss of accuracy and the fact that at extreme range the projectiles descended relatively steeply and hence the "cone" of bullets covered a relatively small area. At a more typical combat range of 3,000 yards (2,700 m), giving a fairly flat trajectory and hence a long "beaten zone" for the bullets, a typical 3-inch or 75-mm field gun shrapnel shell would have a velocity of approximately 900 feet/second. The bursting charge would add a possible 150 feet/second, giving a bullet velocity of 1,050 feet/second. This would give each bullet approximately 418 foot-pounds: seven times the assumed energy required to disable a man. For larger guns which had lower velocities, correspondingly larger balls were used so that each individual ball carried enough energy to be lethal. Most engagements using guns in this size range used direct fire at enemy from 1,500 yards (1,400 m) to 3,000 yards (2,700 m) distant, at which ranges the residual shell velocity was correspondingly higher, as in the table - at least in the earlier stages of World War 1. They used the property of carrying power, whereby if two projectiles are fired with the same velocity, then the heavier one goes farther. Bullets packed into a heavier carrier shell went farther than they would individually. The shell body itself was not designed to be lethal: its sole function was to transport the bullets close to the target, and it fell to the ground intact after the bullets were released. A battlefield where a shrapnel barrage had been fired was afterwards typically littered with intact empty shell bodies, fuzes and central tubes. Troops under a shrapnel barrage would attempt to convey any of these intact fuzes they found to their own artillery units, as the time setting on the fuze could be used to calculate the shell's range and hence identify the firing gun's position, allowing it to be targeted in a counter-barrage. They depended almost entirely on the shell's velocity for their lethality: there was no lateral explosive effect. A sectioned British World War I 18 pounder shrapnel round (top) and complete round (bottom) displayed at the Canadian War Museum, Ottawa. During the initial stages of World War I, shrapnel was widely used by all sides as an anti-personnel weapon. It was the only type of shell available for British field guns ( 13-pounder, 15 pounder and 18-pounder) until October 1914. Shrapnel was effective against troops in the open, particularly massed infantry (advancing or withdrawing). However, the onset of trench warfare from late 1914 led to most armies decreasing their use of shrapnel in favour of high-explosive. Britain continued to use a high percentage of shrapnel shells. New tactical roles included cutting barbed wire and providing "creeping barrages" to both screen its own attacking troops and suppressing the enemy defenders to prevent them from shooting at their attackers. In a creeping barrage fire was 'lifted' from one 'line' to the next as the attackers advanced. These lines were typically 100 yards (91 m) apart and the lifts were typically 4 minutes apart. Lifting meant that time fuzes settings had to be changed. The attackers tried to keep as close as possible (as little as 25 yards sometimes) to the bursting shrapnel so as to be on top of the enemy trenches when fire lifted beyond them, and before the enemy could get back to their parapets. While shrapnel made no impression on trenches and other earthworks, it remained the favoured weapon of the British (at least) to support their infantry assaults by suppressing the enemy infantry and preventing them from manning their trench parapets. This was called 'neutralization' and by the second half of 1915 had become the primary task of artillery supporting an attack. Shrapnel was less hazardous to the assaulting British infantry than high explosives - as long as their own shrapnel burst above or ahead of them, attackers were safe from its effects, whereas high-explosive shells bursting short are potentially lethal within 100 yards or more in any direction. Shrapnel was also useful against counter-attacks, working parties and any other troops in the open. British Expeditionary Force "GHQ Artillery Notes No. 5 Wire-cutting" was issued in June 1916. It prescribed the use of shrapnel for wirecutting, with HE used to scatter the posts and wire when cut. However, there were constraints: the best ranges for 18-pdrs were 1,800–2,400 yards. Shorter ranges meant the flat trajectories might not clear the firers' own parapets, and fuzes could not be set for less than 1,000 yards. The guns had to be overhauled by artificers and carefully calibrated. Furthermore, they needed good platforms with trail and wheels anchored with sandbags, and an observing officer had to monitor the effects on the wire continuously and make any necessary adjustments to range and fuze settings. These instructions were repeated in "GHQ Artillery Notes No. 3 Artillery in Offensive Operations", issued in February 1917 with added detail including the amount of ammunition required per yard of wire frontage. The use of shrapnel for wire-cutting was also highlighted in RA "Training Memoranda No. 2 1939". Shrapnel provided a useful "screening" effect from the smoke of the black-powder bursting charges when the British used it in "creeping barrages". A shrapnel shell was more expensive than a high-explosive one[ citation needed] and required higher grade steel for the shell body. They were also harder to use correctly because getting the correct fuze running time was critical in order to burst the shell in the right place. This required considerable skill by the observation officer when engaging moving targets. One item of note is the "universal shell", a type of field gun shell developed by Krupp of Germany in the early 1900s. This shell could function as either a shrapnel shell or high explosive projectile. The shell had a modified fuze, and, instead of resin as the packing between the shrapnel balls, TNT was used. When a timed fuze was set the shell functioned as a shrapnel round, ejecting the balls and igniting (not detonating) the TNT, giving a visible puff of black smoke. When allowed to impact, the TNT filling would detonate, becoming a high-explosive shell with a very large amount of low-velocity fragmentation and a milder blast. Due to its complexity it was dropped in favour of a simple high-explosive shell. During World War I the UK also used shrapnel pattern shells to carry "pots" instead of "bullets". These were incendiary shells with seven pots  using a thermite compound. When World War I began the United States also had what it referred to as the "Ehrhardt high-explosive shrapnel" in its inventory. It appears to be similar to the German design, with bullets embedded in TNT rather than resin, together with a quantity of explosive in the shell nose. Douglas Hamilton mentions this shell type in passing, as "not as common as other types" in his comprehensive treatises on manufacturing shrapnel  and high explosive shells  of 1915 and 1916, but gives no manufacturing details. Nor does Ethan Viall in 1917. Hence the US appears to have ceased its manufacture early in the war, presumably based on the experience of other combatants. Although not strictly shrapnel, a 1960s weapons project produced splintex shells for 90 and 106 mm recoilless rifles and 105 mm howitzers where it was called a " beehive" round. Unlike the shrapnel shells’ balls, the splintex shells contained flechettes. The result was the 105 mm M546 APERS-T (anti-personnel-tracer) round, first used in the Vietnam War in 1966. 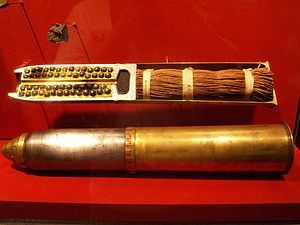 The shell consisted of approximately 8,000 one-half gram flechettes arranged in five tiers, a time fuze, body shearing detonators, a central flash tube, a smokeless propellant charge with a dye marker contained in the base and a tracer element. The shell functioned as follows: the time fuze fired, the flash traveled down the flash tube, the shearing detonators fired, and the forward body split into four pieces. The body and first four tiers were dispersed by the projectile's spin, the last tier and visual marker by the powder charge itself. The flechettes spread, mainly due to spin, from the point of burst in an ever-widening cone along the projectile's previous trajectory prior to bursting. The round was complex to make, but is a highly effective anti-personnel weapon — soldiers reported that after beehive rounds were fired during an overrun attack, many enemy dead had their hands nailed to the wooden stocks of their rifles, and these dead could be dragged to mass graves by the rifle. It is said that the name beehive was given to the munition type due to the noise of the flechettes moving through the air resembling that of a swarm of bees. Though shrapnel rounds are now rarely used, apart from the beehive munitions, there are other modern rounds, that use, or have used, the shrapnel principle. The DM 111 20 mm cannon round used for close range air defense, the flechette-filled 40 mm HVCC (40 x 53 mm HV grenade), the 35 mm cannon (35 × 228 mm) AHEAD ammunition (152 x 3.3 g tungsten cylinders), RWM Schweiz 30 × 173 mm air-bursting munition, five-inch shotgun projectile (KE-ET) and possibly more. Also, many modern armies have canister shot ammunition for tank and artillery guns, the XM1028 round for the 120 mm M256 tank gun being one example (approx 1150 tungsten balls at 1,400 m/s). At least some anti-ballistic missiles (ABMs) use shrapnel-like warheads instead of the more common[ citation needed] blast-fragmentation types. As with a blast-frag warhead, the use of this type of warhead does not require a direct body-on-body impact, so greatly reduces tracking and steering accuracy requirements. At a predetermined distance from the incoming re-entry vehicle (RV) the warhead releases, in the case of the ABM warhead by an explosive expulsion charge, an array of mainly rod-like sub-projectiles into the RV's flight path. Unlike a blast-frag warhead, the expulsion charge is only needed to release the sub-projectiles from the main warhead, not to accelerate them to high velocity. The velocity required to penetrate the RV's casing comes from the high terminal velocity of the warhead, similar to the shrapnel shell's principle. The reason for the use of this type of warhead and not a blast-frag is that the fragments produced by a blast-frag warhead cannot guarantee penetration of the RV's casing. By using rod-like sub-projectiles, a much greater thickness of material can be penetrated, greatly increasing the potential for disruption of the incoming RV. The Starstreak missile uses a similar system, with three metal darts splitting from the missile prior to impact, although in the case of Starstreak these darts are guided. ^ "What is the difference between artillery shrapnel and shell fragments?". Combat Forces Journal. March 1952. Archived from the original on 10 February 2017. ^ a b "The action of Boxer-shrapnel is well known. The fuze fires the primer, which conveys the flash down the pipe to the bursting charge, the explosion of which breaks up the shell, and liberates the balls". Treatise on Ammunition 1887, p. 216. ^ a b " Treatise on Ammunition", 4th Edition 1887, pp. 203-205. ^ a b Treatise on Ammunition 1887, p. 205. ^ Treatise on Ammunition, 10th Edition, 1915. War Office, UK. Page 173. ^ Reserve Lieutenant Walter Schulze of 8th Company Reserve Infantry Regiment 76, German Army, described his combat introduction to the Stahlhelm on the Somme, 29 July 1916. Quoted in Sheldon, German Army on the Somme, page 219. Sheldon quotes and translates from Gropp, History of IR 76, p 159. ^ Ethan Viall, "United States artillery ammunition; 3 to 6 in. shrapnel shells, 3 to 6 in. high explosive shells and their cartridge cases". New York, McGraw-Hill book company, 1917. Hogg, OFG. 1970. 'Artillery: its origin, heyday and decline'. London: C. Hurst & Company. Wikimedia Commons has media related to Shrapnel shell.